Although I don’t have a strong aversion to vegetables, I’m also not one of those people who can just magically chomp down vegetables like a rabbit. 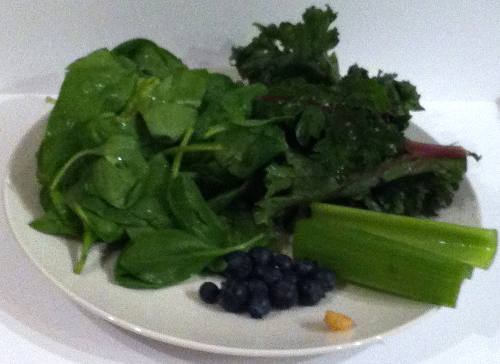 My way of getting all those healthy raw vegetables is to make it into a shake! It’s so simple. I stick everything you see on that plate, a few ice-cubes, and a touch of water or iced tea all into the blender and hit blend. Voila! 10 seconds later, I have a perfectly green and delicious shake. The exact recipe follows after the picture. Place all the ingredients into the blender and blend well. You might have to gently shake the blender a bit for the veggies to shift down and become blended. Alternatively, stop the blender and push the remaining veggies down with a spoon. 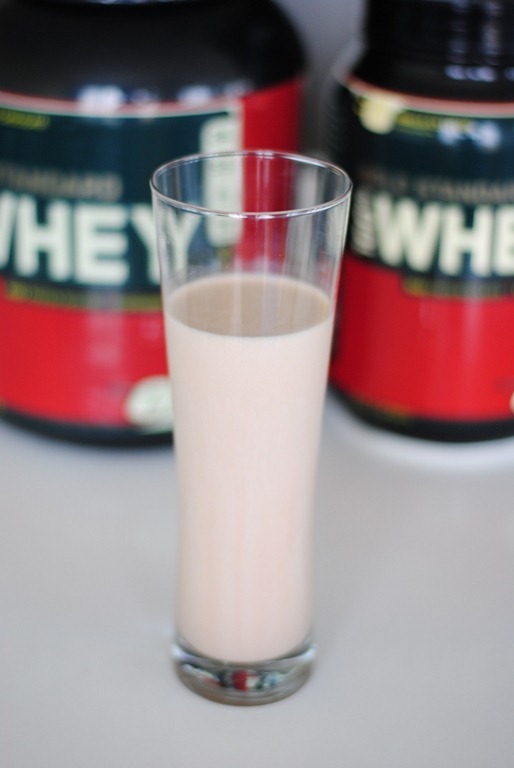 You can also add in a scoop of protein powder for an extra nutritious shake. I know the shake doesn’t look all that appetizing because it’s green, but honestly, what did you expect? I did add in a bunch of green vegetables! It’s the summer, I’m hot, and I’m thirsty. So here’s the perfect low-carb drink to have when you’re lazing in the sun. Cut up the blueberries or other berries into reasonably small pieces (you probably only have to halve the blueberries). 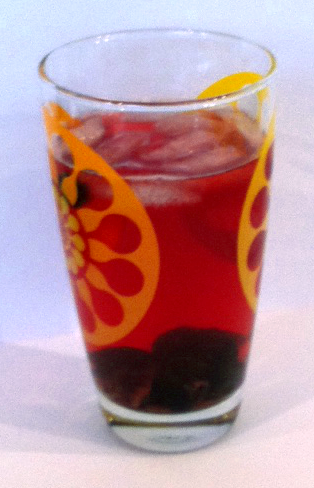 Place the berries into a blue and crush with a fork or spoon. Pour crushed berries along with their juice into a glass. Squeeze in juice from a quarter of a lime. 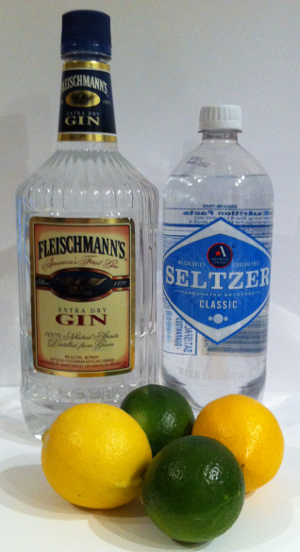 Top with seltzer water. Stir and enjoy! A drink anyone? I love wine, and I love cocktails, and most of all, I love Pimms and lemonade (it’s a British thing, best enjoyed while lazing in a boat being rowed by someone else). Like most professionals in this city, alcohol seems to be a necessary part of every friday evening (well, and saturday evenings, and various other evenings, but shhhhh). But the carb content in wines and cocktails is so high that being on the diet was seriously disturbing my weekend activities, not to mention my wine blog! So what can I drink on a low carb diet? Pretty much all diets tell you to not drink any alcohol, but those are pretty hard diets to stick with! Luckily, there are alcohols that are low in carb and even carbless! Wines: Wine calories are pretty high (and since wine pretty much always has some residual sugar, they have carbs). A dessert wine or a sweet riesling is high in calories and in carbs (approx. 150 calories and 16g of carbs for a 4oz serving). That definitely makes me think twice about opening all those bottles of riesling clogging up my fridge! But a 4oz glass (a stingy pouring) of red or white wine has around 100 calories and 2-3g of carbs. So a small glass is maybe doable a few times a week. Champagne: If you’re just looking to hold a pretty glass and look like you’re drinking, then champagne or one of the other bubbly alternatives (e.g. brut or prosecco) is the way to go! A glass of bubbly has 85 calories and 1.2g of carbs (for a 4oz serving). But what do you expect? You are after all mostly ingesting air! Beer: I guess the beer belly thing sort of gives this one away. A bottle of Bud Light has 110 calories and 6.58g of carbs. A regular Bud is 146 calories and 10.6g of carbs. I think this is definitely the avoid at all cost option (along with all cocktails). And the winner is…HARD LIQUOR! Who would have thought that all those shots you drank last night was actually healthy! Distilled alcohols like gin, rum, whiskey, and vodka are all carbless. Yep, a shot of any of them contains 97 calories and 0 carbs. And who says you can’t have fun on a diet! The reason why there are no carbs is because it’s pure alcohol, which is not technically considered carbs. I don’t really like drinking water – it seems too flavorless to me. Before this diet, I would drink plenty of soda, vitamin waters, powerades, teas, and coffees. Well, all of the diet drinks are out because they have artificial sweeteners, (which cause similar insulin effects as real sugar) and I’m trying to cut down on caffeine as my stomach doctor tells me that caffeine can cause heartburn. So, I’m not left with very much sadly. Caffeine free iced tea has become my consolation. It’s really easy to make, and you can use just about any kind of tea, from black teas to green teas to herbal teas. There’s a lot of interesting tea flavors out there so there’s plenty of variety to keep me from getting bored with one taste. 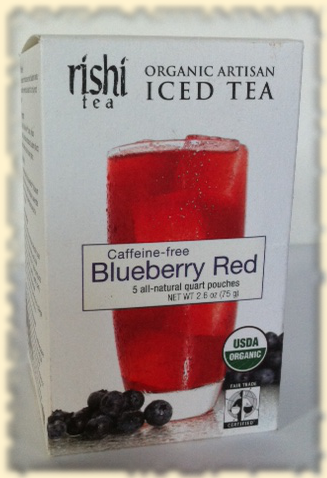 I just bought the Rishi Blueberry Red, which is a blend of rooibos, hibiscus, licorice root, and blueberries. Pour the hot water into the tea pot with the tea bag (I use one of the Rishi tea bags with about 1.5 liters (or 50 oz.) of water. Then let it cool for a few hours before taking the tea bag out and pouring the tea into a jug to put into the fridge. Of course, you can take the tea bag out earlier if you want a weaker tea. You also don’t have to put it into a jug before putting into the fridge – I just prefer it as my jug is prettier! If you’re in a hurry to drink you iced tea, just put some ice cubes into a glass and pour the tea in. 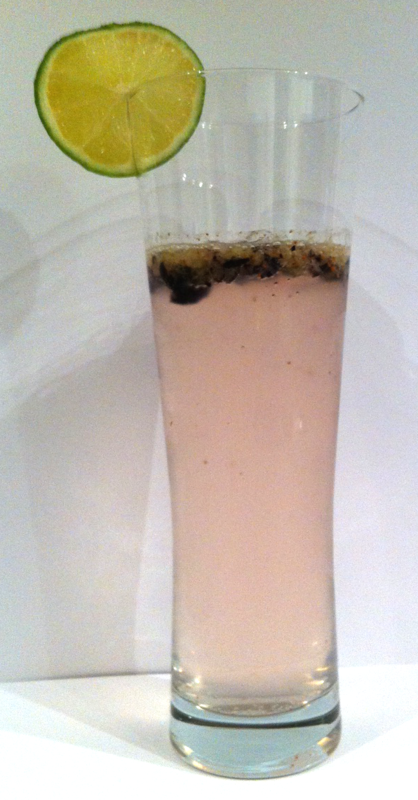 To make it look even prettier, you can add some freshly crushed blueberries into the tea after it’s been refrigerated. Another favorite tea of mine is barley tea (they serve it in many korean restaurants). You can buy the Marubishi barley tea online at amazon.com or you can probably find it at your local oriental supermarket. Of course, you don’t have to make cold iced tea. You can also drink all of these teas hot!